The growth of national economic regulation and the process of globalisation increasingly expose international transactions to an array of regulations from different jurisdictions. These developments often contribute to widespread international contractual failures when parties claim the incompatibility of their contractual obligations with regulatory laws. The author challenges conventional means of dispute resolution and argues for an interdisciplinary approach whereby disciplines such as international economic law, conflict of laws, contract law and economic regulations are functionally united to resolve international and multifaceted regulatory disputes. He identifies the normative foundation of contract law as an important determinant in this process, contending that contract law is essentially neutral and underpinned by the concept of corrective justice, while economic regulations are mainly prompted by distributive justice. Applying this corrective/distributive justice dichotomy to international contracts, the author critically assesses major conflict of laws approaches such as `proper law', `the Rome Convention' and `governmental interest analysis', which could disregard either public interest or private rights. The author, taking these theories into account, proposes an alternative two-dimensional interest analysis approach. 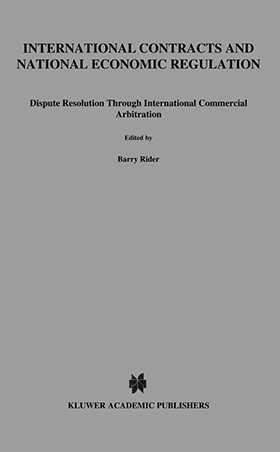 He tests the viability of this approach with reference to arbitral awards and court decisions in various jurisdictions and concludes that it uniquely fits into the structure of international commercial arbitration. In adopting this approach arbitrators would take into account both corrective and distributive justice, and to the extent that corrective justice prevails, would be able to avert a total failure of the contract.